Our worship services take place Sunday at 9:30a.m. The children spend the first 15 minutes in the sanctuary before attending their Sunday School classes. 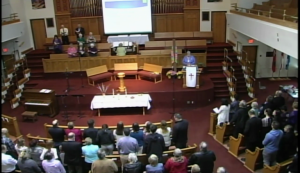 At Central United Church we worship using a traditional liturgy with some contemporary touches, including using a LCD projector. Music is a large part of our worship; we use both United Church Hymn books, Voices United and More Voices. Our dedicated group of volunteers meet every Sunday morning at 9:00a.m. to prepare special music for the worship services. They are led by choir director – Ken Jackson and musician Mary Chambers on the Cassavant Pipe Organ or piano. The choir is always looking for new members. If you love music and would like to get involved, talk to Ken or Mary.